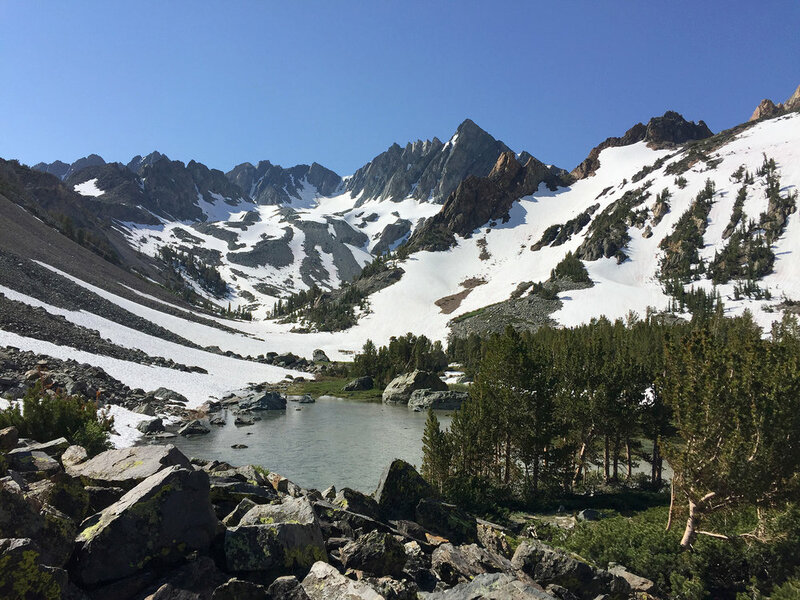 The Sierra High Route (SHR) is a largely off-trail exploration devised by Steve Roper in the 70's that runs down the center of the Sierra Nevada. 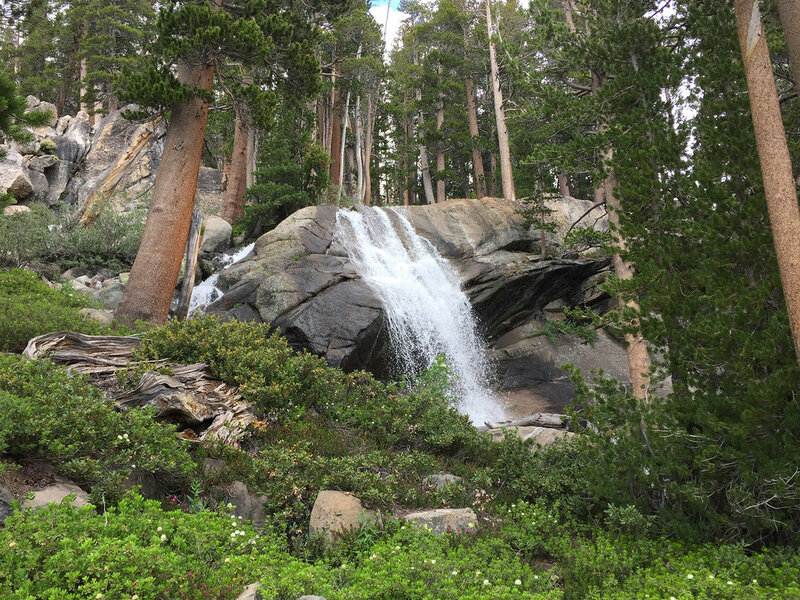 It skews at high elevations of between 9,000 to 11,500 feet and only occasionally connects with the John Muir Trail. It is physically demanding and requires wilderness navigation skills and non-technical climbing skills. Few people attempt the route which enhances its wonderful sense of solitude. This summer I completed the route in four sections, walking a total of 20 days, 214 miles and 62,000 feet of elevation gain, including 33 high passes. 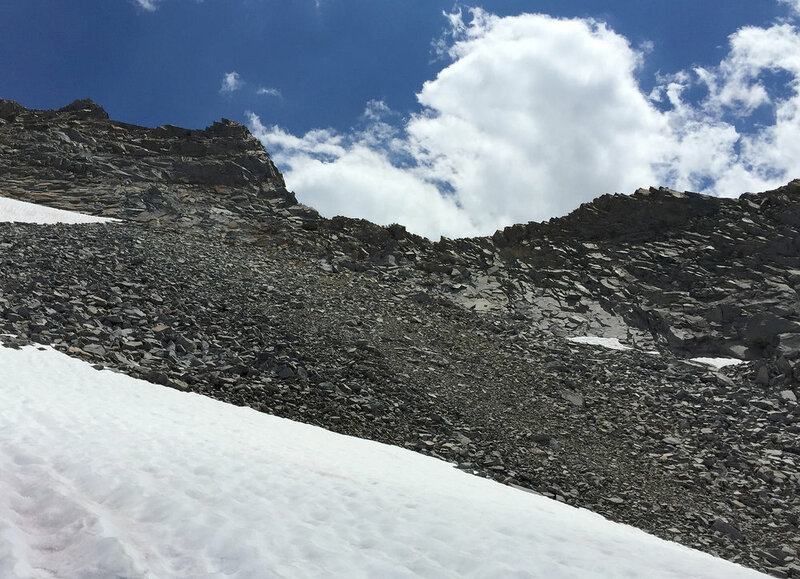 Because of the massive snow this year many decided to avoid the Sierra this year, but for me the snow was an incentive, at least for the snowy first half of the trip, as walking over snow is less onerous than negotiating the many tedious talus (rock) fields. During the course of my journey I meet only five other people walking the entire route. Section 1- July 12-15, 3 1/2 days. 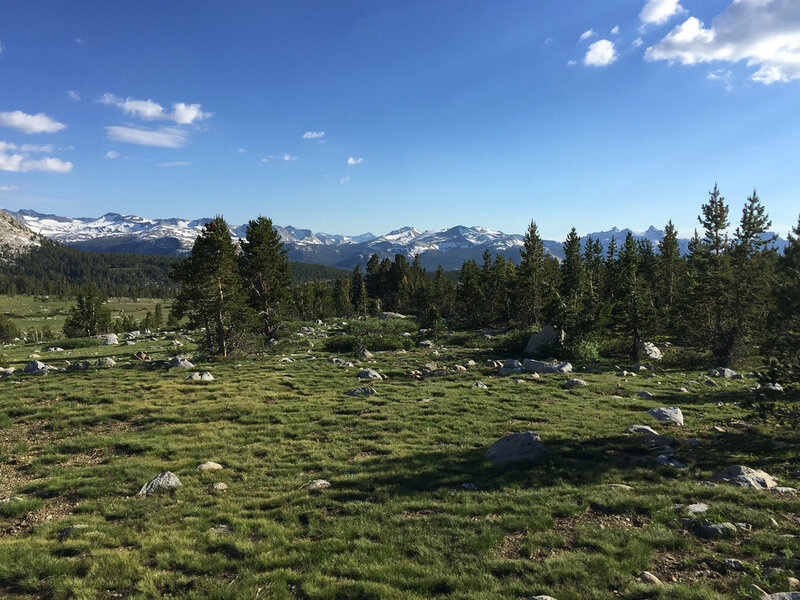 Twin Lakes to Tuolumne Meadows, SOBO. I pick up the permit in Bridgeport to begin my hike on July 12. Most people take the route going NOBO (north-bound); I decide to go SOBO (south-bound) instead. As a first indication of the unusual snow year, the ranger tells me that she has so far issued only one similar permit this summer. As I climb the trail from Twin Lakes the water is absolutely raging down Horse Creek, hinting at the ongoing snow melt above. 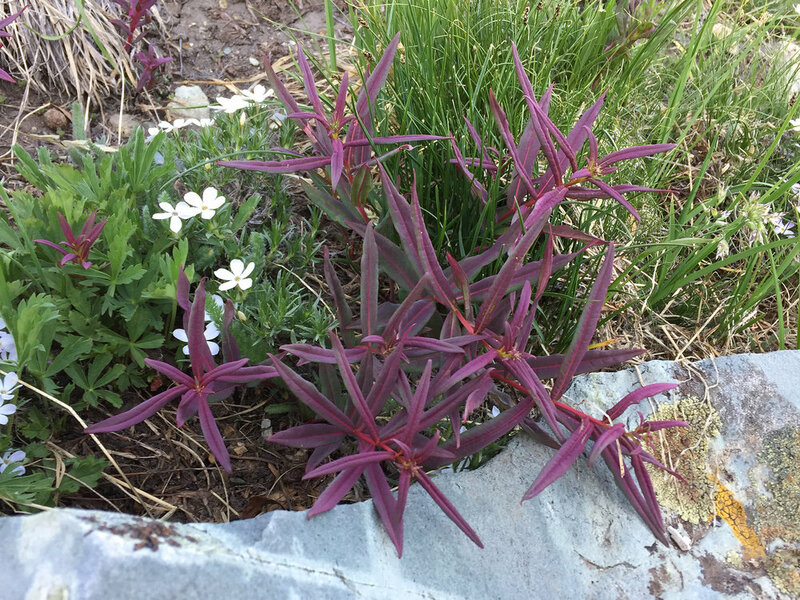 Because of the varying levels of snow melt, I witness spring vegetation all through the summer. I am soon surrounded by snow where I put my new lightweight aluminum crampons and ice axe into action. I record tracks of my trips and place them afterwards into Google Earth. Twin Lakes is at the bottom right, and my first destination of Tuolumne Meadows is at top left. Matterhorn Peak is one-third up the track running from right to left. Panorama viewed from top of Matterhorn Peak. The Sawtooth Range viewed from Matterhorn Peak (12,279 ft.). The peak is an easy climb from the pass. It has the minor distinction of being mentioned by Jack Kerouac in "The Dharma Bums". 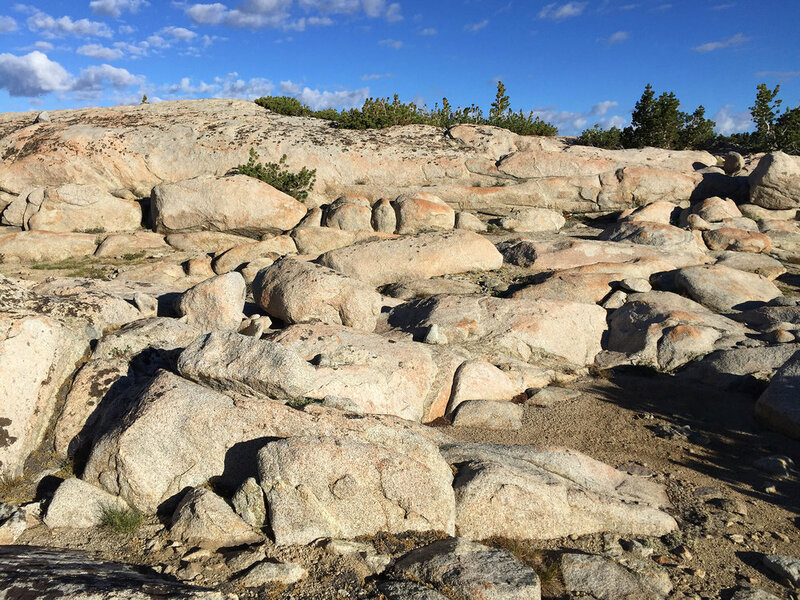 I love climbing the occasional peak to get the broad view of my surroundings, but climbing from the trailhead to a tall peak on the first day of my hike is not a great idea as my body is not yet acclimated to the altitude nor in top hiking shape, so I am a bit weary on the second day. The plants in the valley have been waiting all year to bust out. 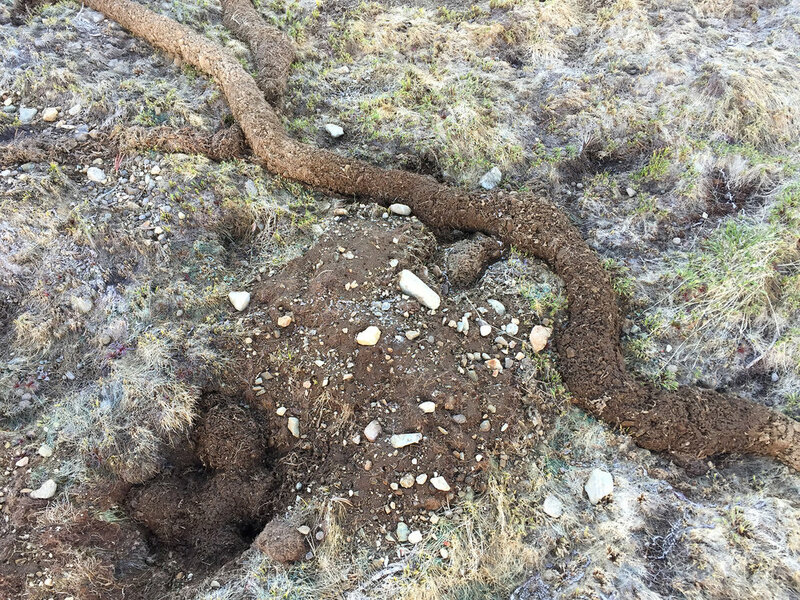 The melted snow exposes elaborate tunnels and furry balls created by some kind of rodent. I realize that my knowledge of Sierra animal life is deficient. 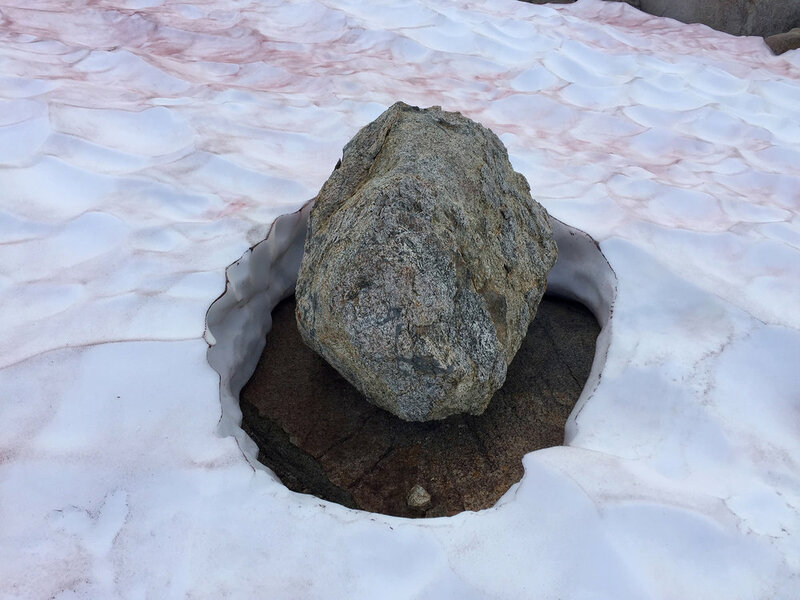 Summer snow brings suncups, odd melted depressions in the snow that can help or hinder walking progress depending on their size and location. View looking back to the Sawtooth Range with Matterhorn Peak the last peak on the right. 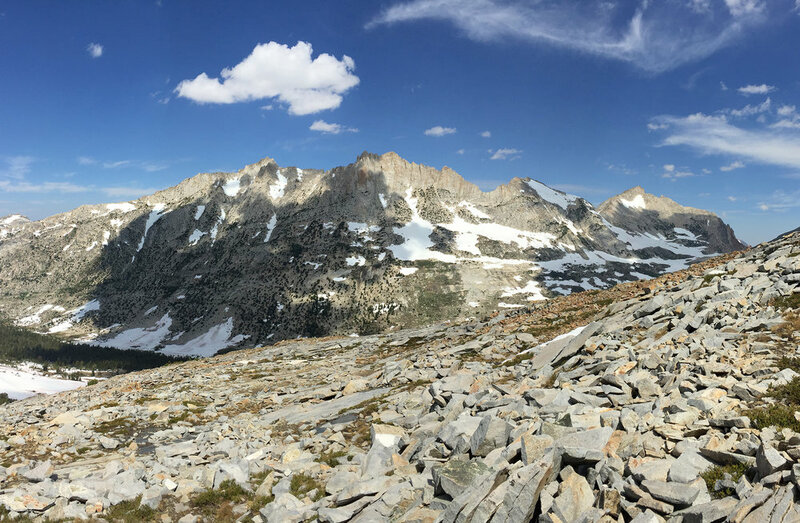 Occasional bad navigation or poor route choices are expected mistakes on the Sierra High Route. Stanton Pass should be easy but as I approach from an unusual direction my view of my options is not good and I choose a very bad route that costs me a few wasted hours without success until I descend and start over. Made it to the top, time to relax. One way to conceptualize the SHR is as a series of 33 passes, 33 hurdles. At the top of each pass you try to visualize the route as far forward as possible. In this case, I know that I must descend, cut diagonally across while alternating between walking on rocks and snow, take 30 minutes to go to the base of the nearest hill, and then turn right and head down. I find a dry spot where I can cowboy camp. I awake the next morning to evidence of a cold night. The suncups appear velvety soft but are actually very frozen and hard in the early morning. 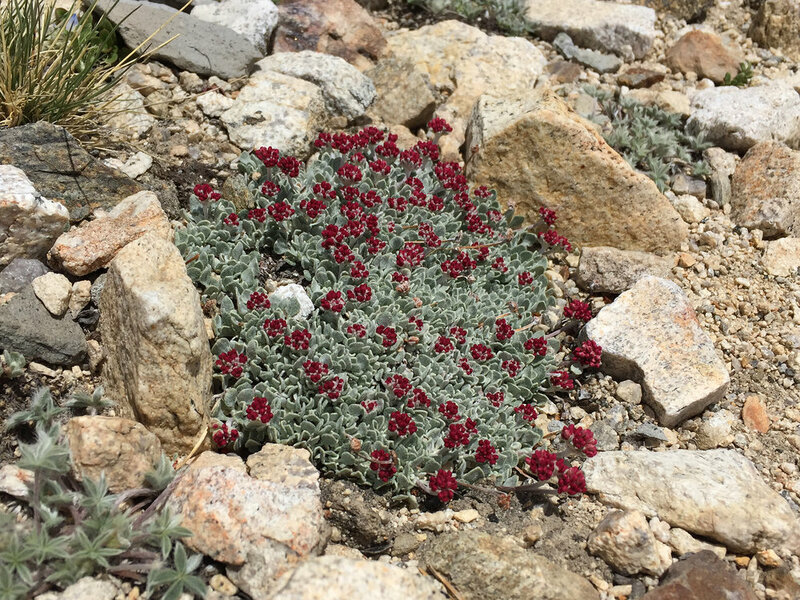 Wow, I never see flower blooms like this in normal summer hiking conditions. The long haul up to Sky Pilot Col is made easier by the snow covering the talus rocks, but the reflections of the summer sun burn my face. This final ascent up Sky Pilot Col would be nerve-wracking without the requisite ice axe and crampons. As I drop to lower altitudes, I come across large areas where I am uncertain where the water is, and how much I can trust the snow and not fall through. I knew that this trip would involve a lot of snow, but did not appreciate that summer melting snow also means that the sound and presence of water are everywhere. 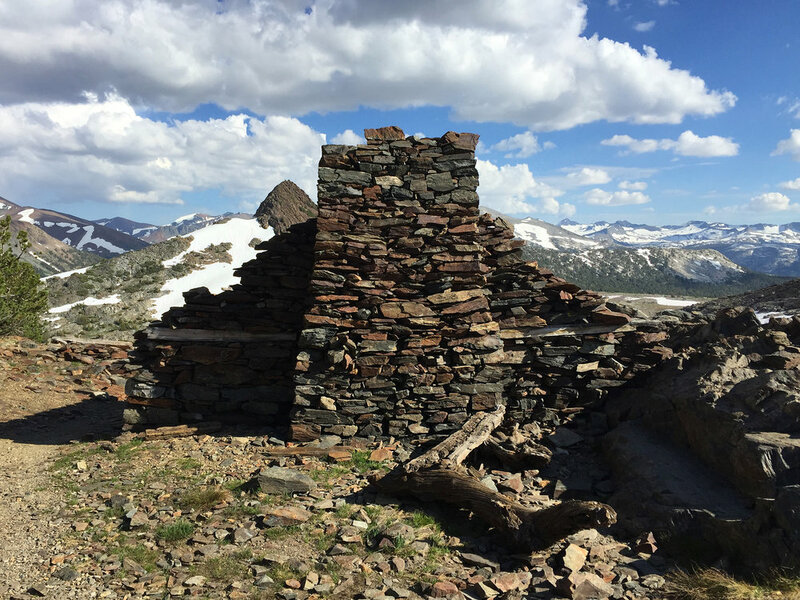 Final day of my first trip, I descend past the remains of the Great Sierra Mine cabin. I am now in North Yosemite, and it lives up to reputation as one of the most buggy areas in the park. Large parts of this area are marshy bogs, and the bugs swarm my face net. I can't wait to get to the road. I get lucky and score an immediate ride from Tuolumne to my parked car at Lee Vining, drive to Bishop, eat, and stay at a lousy motel. I like Bishop, but the motels are not great. Next time, I'll go to the Super 8. After most Sierra adventures I often take all day to drive home, as the thought of immediately returning to civilization is just too horrible to contemplate. Usual stop at the 'bama. I troll the abandoned buildings along 395 and make impromtu assemblages. Some come home with me. Section 2- July 23-27, 4 1/2 days. 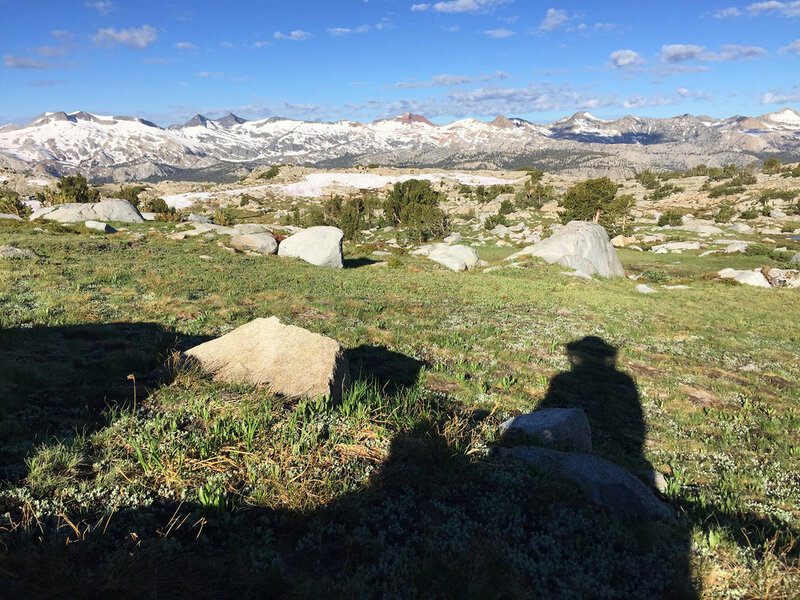 Tuolumne Meadows to Mammoth, SOBO. I spend the night at the hikers hostel in Lone Pine, depart early and drive to leave my car at Mammoth, and take the 8 AM bus to Tuolumne Meadows. When I arrive I can't believe it- the place is totally deserted, and most structures are closed and/or under repair. In some years the Tuolumne is sold out in early June and PCT hikers clog the area in front of the store. It obviously got whacked hard this year by the heavy snowfall. The permit office is open however. I go in to find three rangers staring intently at their monitors. One asks me where I want to go. When I say "High Route" it gets their attention and they all look up. One guy says "cool". I get the usual question if I know what I am in for, and am told that I am the first person this season to ask for such a permit. Hard to believe; it just does not seem to me that the people who are qualified to hike this hike would be put off by some snow. Some distance into the hike I see this disturbing poster. There is almost always a bad resolution to these situations. I read later that Rika's body was found floating in a river. Several people drowned in river crossings this summer, and it is just so very sad. 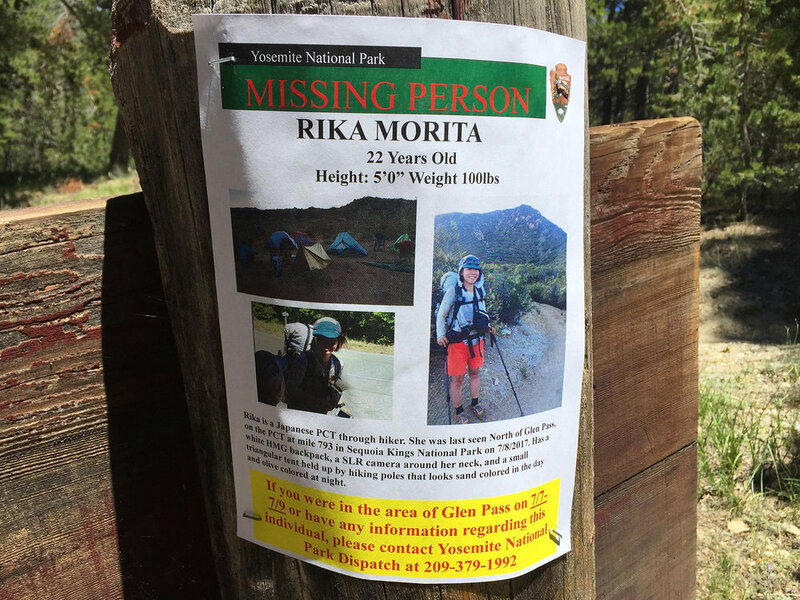 At least the word got out and a large number of thru-hikers avoided the central Sierra portions of their hikes until later in the season. The trail hike up to Vogelsang helps to improve my mood. The snow was just too much this year so none of the Yosemite High Camps were assembled. I read that the Yosemite "T" blazes are old 90's U.S. Cavalry marks for snow navigation. Not sure if that is correct, but it makes for a great story. These rocks look even more super-real than the ones in Frontier Land. Water like I've never seen it. I make it to an unnamed lake that is not indicated on some maps. Nice, but too buggy to enjoy. 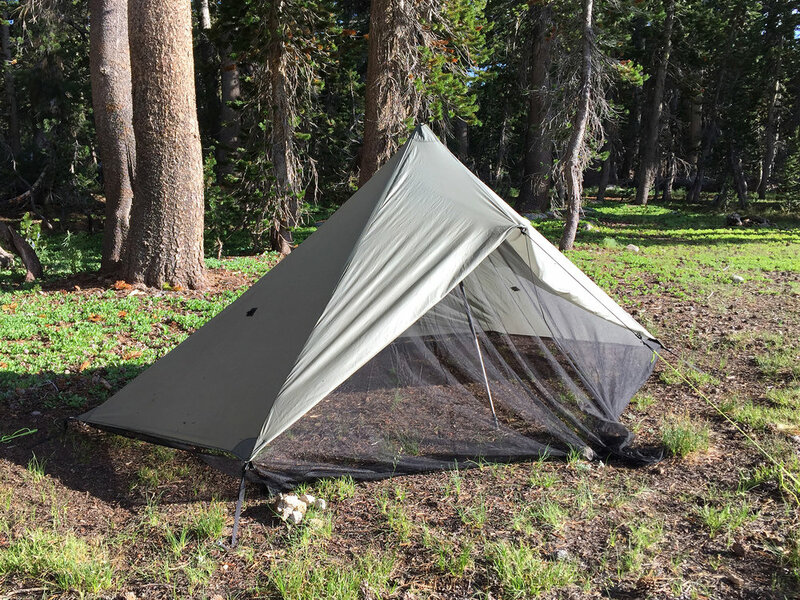 I have a silnyon Descutes tarp with a perimeter net I attached that works well enough to hold the mosquitos at bay. Day two- Una Bella Giornata. I take a long pause to enjoy my smoothie and power bar in the early morning sun while enjoying the view of the Clark Range and Red Peak. I put on my headphones and amplify the experience with the Eroica symphony. (Factoid: Beethoven was inspired by and originally dedicated this symphony to Napolean, naming it "Buonaparte".) This is perhaps my favorite moment of the entire trip, only made slightly less perfect by the need for a bug net. Blue Lake Pass. 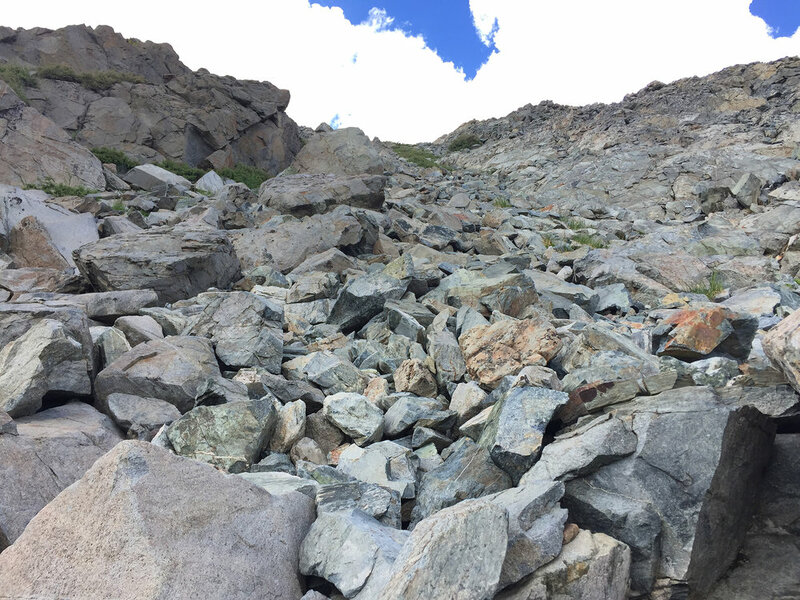 Lousy long talus approach on left, but easy firm climbing at top. Last look back at the Clark Range. First view of the Ritter Range. In distant views like this I often trace the path of where I will be the next day. I am not in a hurry and walk at a relatively leisurely pace, but on this hike I am always concerned about making it over the last pass before darkness, which tends to inhibit lingering and my extracurricular swimming. In this case however I submit to the pull of the water, emerging invigorated. In another life I was or will be a hard-core birder. The talus is a prime component of the HSR experience. The size of the talus, sharpness and stability vary a lot. With good balance and technique it is possible to zoom over it quickly. But it is also all to easy to twist an ankle or to take a painful fall. Knock on wood. The Rosetta stone of the Sierra. Some day we will be able to understand what these visitors to earth were attempting to communicate to us. Something like "watch out for global warming or your planet will die like ours did". Curious rock with curious holes. Feels volcanic. Twin Island Lakes. I'll pass on jumping in this one. Actually, there is a crossing at the end of the lake where the water was as high as the tops of my thighs. A real "Sound of Music" moment. Snow cone drinks of my youth. I start out with Hawaiian Punch but get tired of it and switch to Tang. Nothing beats the sugar rush of a glass of Tang and one Snickers bar. The route weaves in and around Mt. Ritter and Banner Peak, bobbing up and down around tree-line. Thousand Island Lake is at the bottom left. Most people do not experience the west end of Thousand Island Lake as the John Muir Trail is on the other side. Still nary a person. A beautiful night under the stars. Imagine: Thousand Island Lake with no mosquitos. Nor people. An almost frozen Garnet Lake. Mt. Ritter is on the left and Banner Peak on the right. I contemplate a climb of one of them as I am perfectly situated for an ascent, but feel that I am not experienced enough in snow peak ascents and instead just admire them from a safe distance. I keep a tight kit and often use my readily accessible sit pad. 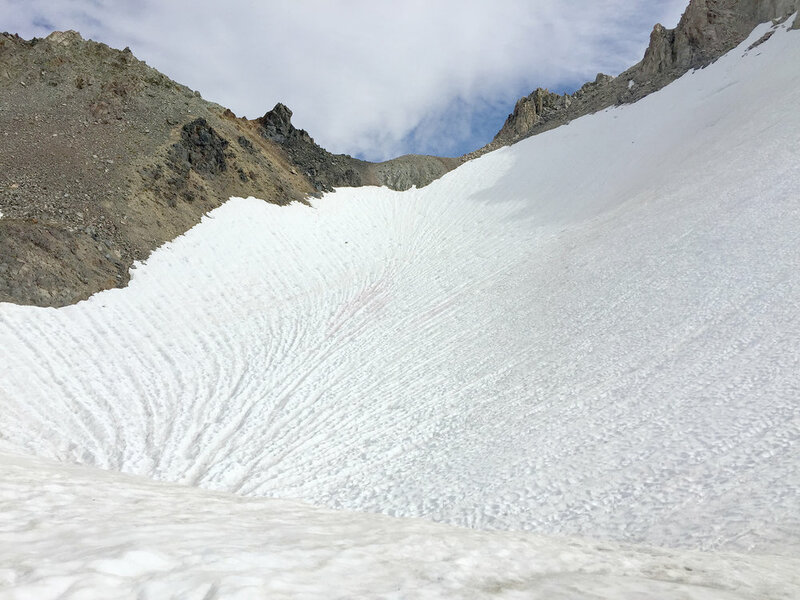 This snow wall at Iceberg Lake is much longer and steeper than it appears in the photo. I wear crampons and do a lot of kick-stepping. Along Cecile Lake I meet Sherpa (Paul) from San Anselmo; he is section hiking the SHR as well but going NOBO and is the first person I meet after 8 days of hiking. I descend to Minaret Lake and once again fend off a full-scale mosquito attack. I stop to eat at El Ranchito in Bishop for nostalgic memories of past trips, but it is still mediocre. Amigo's next door is by far the best Mexican food this side of the Sierra. Pynchon-like strangeness abounds along the 395.